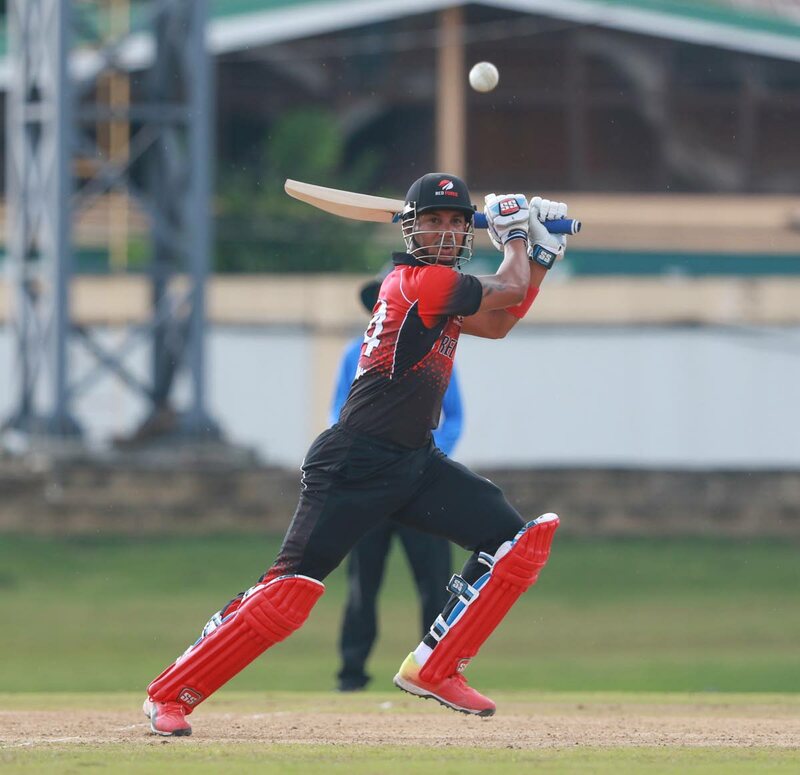 TT Red Force’s Lendl Simmons made his third consecutive half century for the tournament. TT Red Force secured a semi-final place in the 2018 Super50 competition with a comfortable seven-wicket victory over defending champions Windward Volcanoes at the Brian Lara Stadium, Tarouba, last evening. Winning the toss and electing to field in a rain-affected game that commenced at 4.45 pm and was reduced to 38 overs, the Red Force routed the defending champions for a paltry 78 all out in 22.1 overs – the lowest for the tournament thus far. Only left-handed batsman Gidron Pope (37), who was part of victorious 2016 West Indies Under-19 World Cup winning squad, put up any resistance with the bat. This excellent team performance was led by leg-spinner Imran Khan (4-0-13-3, who was brought into the game for the injured Sunil Narine. Khary Pierre (3.1-0-7-2) and Rayad Emrit (4-2-8-2) contributed with two wickets apiece. In reply, although they lost three early wickets of Kieron Pollard and Darren Bravo without scoring and Jason Mohammed (3), to left-arm spinner Kavem Hodge, Lendl Simmons’ (52) third consecutive half century of the tournament guided TT home in the 10th over. Dwayne Bravo and Ravi Rampaul opened the overs with the ball, followed by Rayad Emrit bowling at first change immediately set the trend for the home side as the trio were getting the ball to swing appreciably. This resulted in Tyron Theophile (1), Kirk Edwards (7) and Hodge (3) perishing to the clever new ball bowling. When Mohammed’s part-time off-spin clinched the big wicket of domestic veteran Devon Smith (2) caught by wicket-keeper and captain Denesh Ramdin, the Volcanoes capitulated from 34-3 to lose their final seven wickets for 44 runs to the spin duo of Khan and Pierre. Rain began to drizzle in the chase while Hodge caused a minor scare when he had Pollard comprehensively bowled, while both Darren Bravo and Mohammed gifted lofted mid-on catches to Roland Cato as the Red Force slipped to 23/3 in the sixth over. However, Nicholas Pooran (25) joined Simmons and launched a flurry of sixes against Hodge and left-arm paceman Delorn Johnson in unbeaten quick-fire, 60-run fourth wicket stand with Simmons ending the game by bringing up his half-century, with a massive six over the mid-wicket boundary off Hodge. Red Force are next in action against West Indies B, on Friday, at the Brian Lara Cricket Academy, Tarouba, from 2pm, where they will be looking to finish ahead of Guyana Jaguars as Group leaders before heading off to Barbados. Reply to "Red Force earn semis spot"